Central Station is an office building as well as a large downtown parking garage. Over 7 years of operation, this property used both corrosion coupon and eddy current testing to verify that corrosion rates were maintained in the excellent ranges. In the seven years since the Terlyn System was installed, the cooling tower at The Central Station Building has conserved 6,484,701 gallons of water. This dramatic reduction in water consumption reduced their water bills by a total of $43,512. 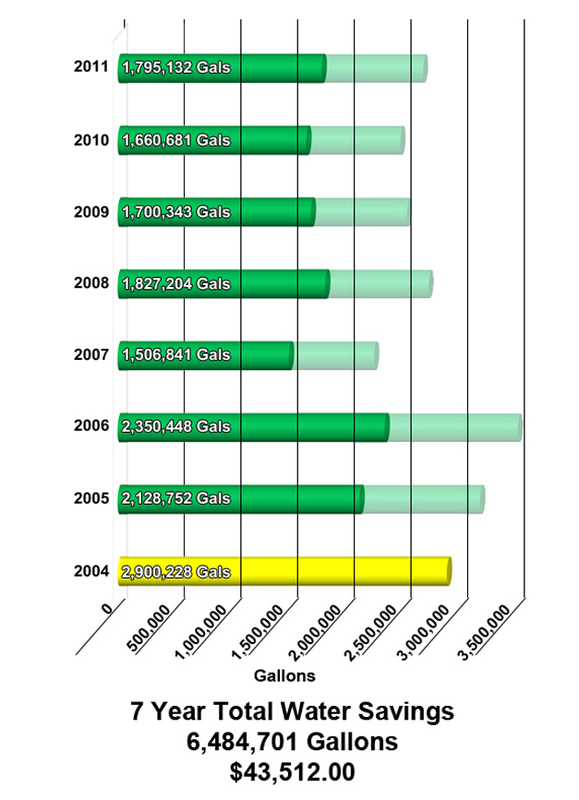 The savings graph represents the total cooling tower water usage previous to installing the Terlyn Program in 2002. Each consecutive year on the Terlyn Conservation Program shows the actual water usage, as well as what the water usage would have been had the system remained at three cycles of concentration, or 33% waste(represented by the lightly shaded portion on the right side of the bars).